A sculpture showing how I feel the human race is treating the planet – by putting it into the waste bin. 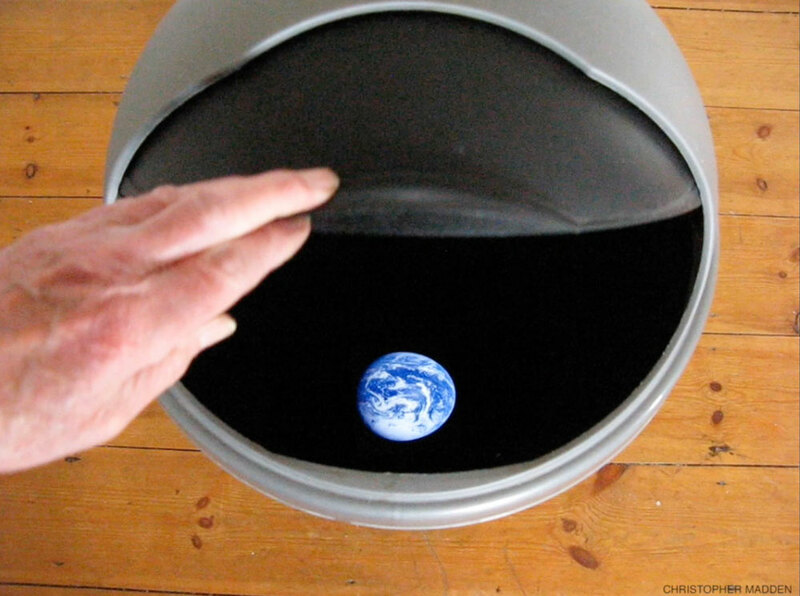 The sculpture consists of a standard kitchen waste bin, lined internally with black material and with a back-lit image of the earth at its base. 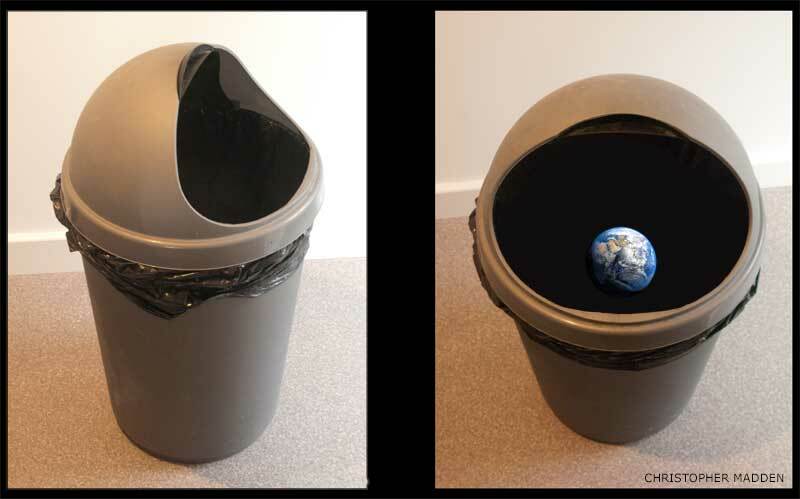 The result is the illusion that by looking into the bin you are looking into outer space as though through a porthole in a spacecraft, with the earth appearing to be floating in the distance. The kitchen waste bin was deliberately chosen as the reciprocal that contains the earth because of its banality, to emphasise how we are depleting the earth’s resources through mundane consumption. 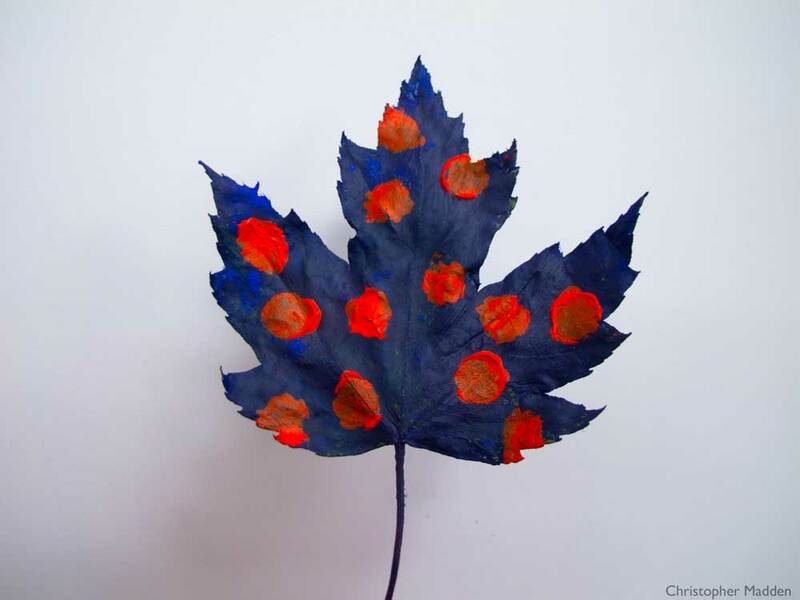 A maple leaf painted blue with red polka dots. The leaf had fallen from the tree in autumn. The inspiration for this work came partly from the fact that the leaves on the trees were changing colour in the autumn, prompting me to think of changing their colours in other ways. 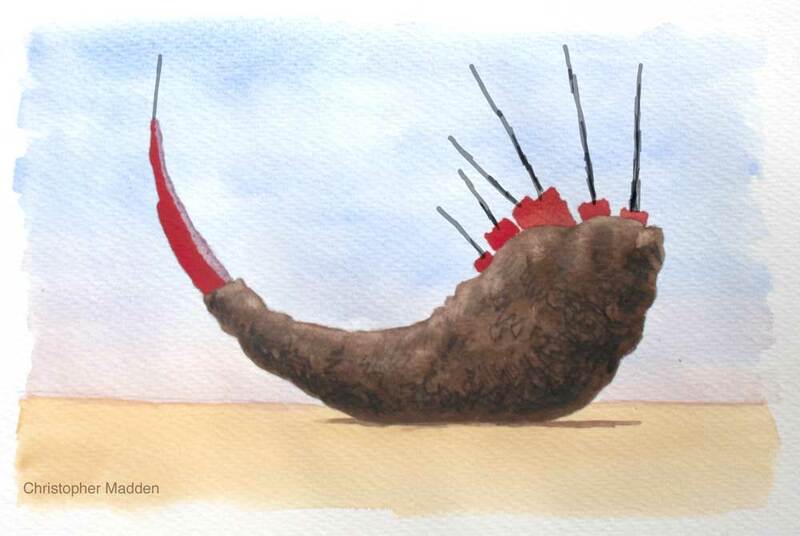 In previous years I’ve painted acorns and suchlike in unusual colours. Like a lot of my work, this work is involved interacting with and responding to the natural environment. 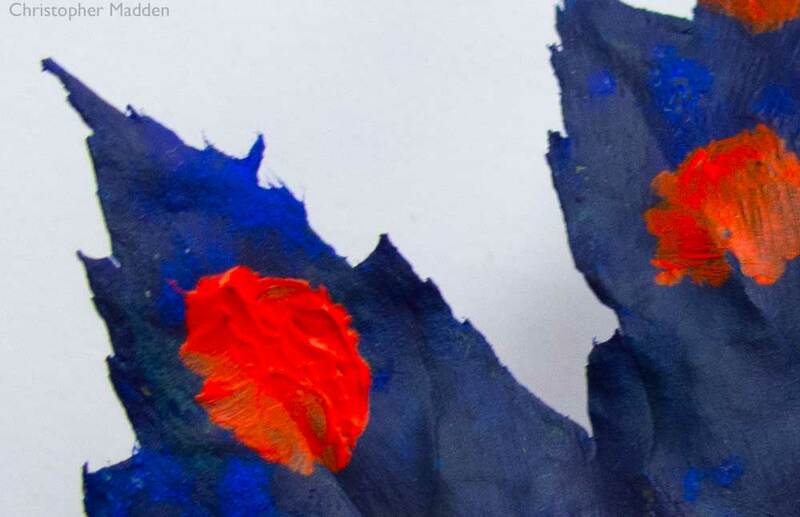 A detail of the painted leaf. The creature in this video isn’t a woodlouse, it’s a pill millipede, of the species glomeris marginata. It’s climbing up the outside of a door frame. I was struck by the way that the millipede seemed to be gliding along its course up the door frame as though hovering slightly above it, as its multitude of legs are concealed. I also like the armour plating, which, along with the hovering, makes the creature look like either a high tech machine or an alien. Or a hybrid of both. The feelers help too. When I made this video I assumed that the flies that it features were house flies that had been feasting on a rotting animal carcass concealed somewhere within the walls of the building. The sinisterness of the insects was intended to be a feature of the video. Since then a bit of research has informed me that the insects were in fact harmless cluster flies (pollenia rudis). Cluster flies enter buildings on autumn evenings in search of shelter from the worsening weather conditions. Then the following day they sometimes want to get out again, as in the video. They may enter buildings in small numbers or they may enter in thousands. In the case in the video it was many many hundreds. The flies live in the countryside, where their larvae feeding on earthworms. They aren’t a health hazard (as far as I know). Knowing that the flies were harmless and had entered the building seeking shelter rather than being house flies fresh from a rotting corpse in the attic altered my view of them considerably, and I now rather like them, at least on the video. They are an inconvenience though. I particularly like the way that the flies in the video are moving in an almost choreographed manner. It’s like a little piece of performance art. The nice calm view out of the window (apart from a bit of wind) is in stark contrast to the dynamic motion of the flies on the window pane. 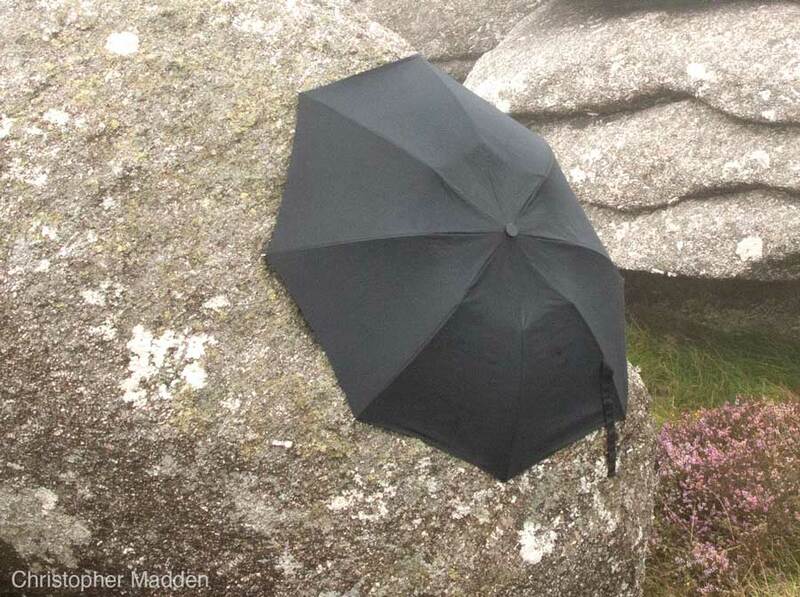 A work consisting of an umbrella clinging limpet-like to a granite rock on a hilltop in Cornwall. 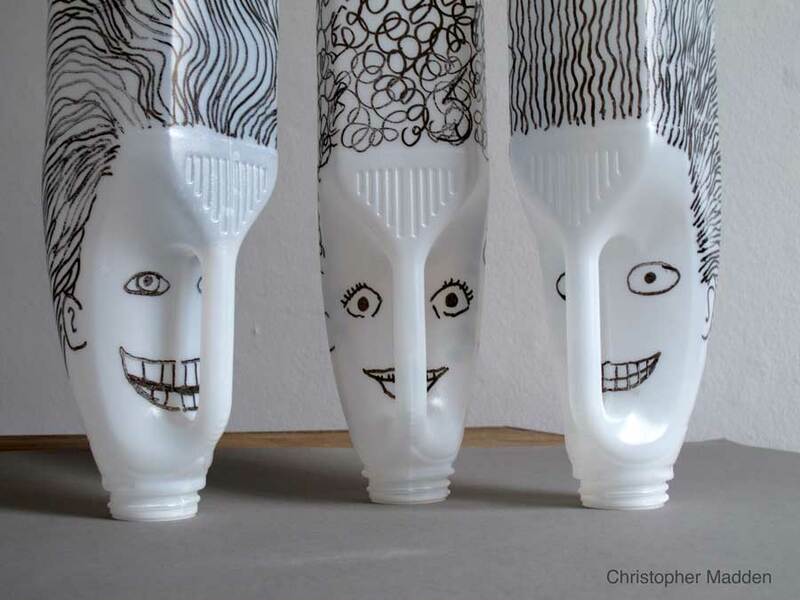 Slightly unsettling heads created from empty plastic milk bottles. Like many artists I have a habit of collecting waste and recycling it into works of art. 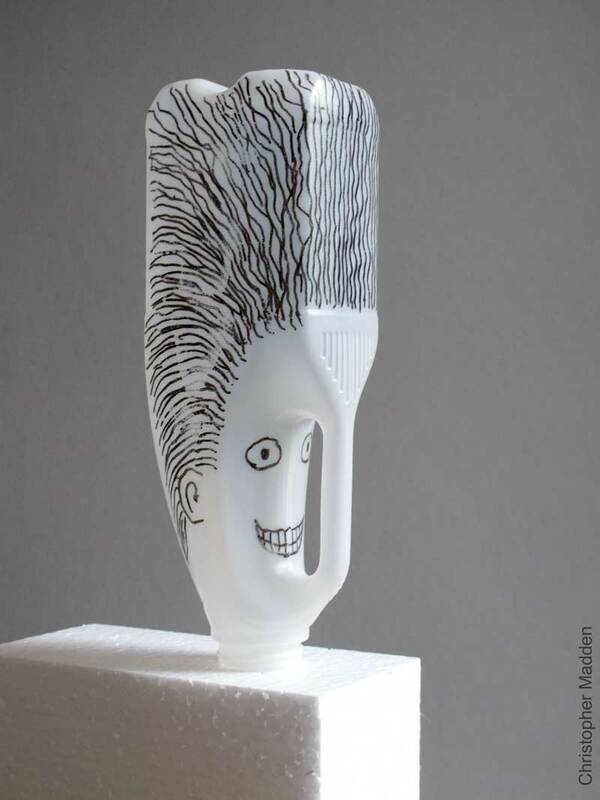 The sinister appearance of these heads, drawn as they are on post-consumer waste in the form of discarded plastic milk bottles, can be interpreted as a comment on the fact that we as humans are destroying the environment through (amongst other things) our profligate use of plastic packaging. The fact that the heads also resemble the type of craft-play objects produced by children can be interpreted as alluding to the western world’s current tendency towards a philosophy of consequence-denying pleasure seeking in which the adults in society fail to take responsibility for their actions beyond immediate self-gratification. 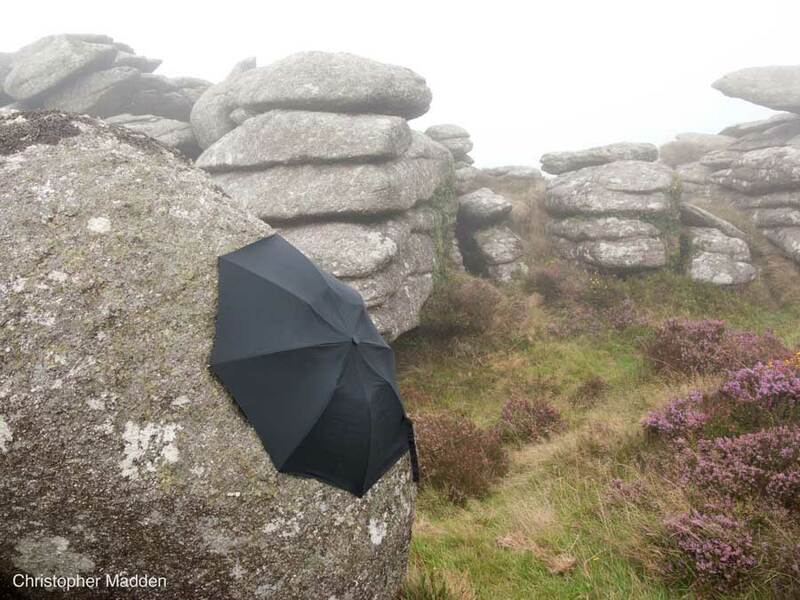 A work consisting of an umbrella clinging to a granite rock on a misty hilltop in Cornwall. This image, like many images that I’ve created recently (mid 2018) is a work that is largely generated from my imagination. Having said that, the original inspiration for the crescent-like form was a piece of toast crust. The work contains definite ominous overtones. These are probably linked to the general atmosphere of foreboding that seems to permiate society at the moment (manifesting itself in such things as the election of Donald Trump in the USA and the swing of many European countries to the right). On top of this the phenomenon of global warming threatens to disrupt the earth’s entire ecosystem and to overturn all civilisation as we know it. Things have only just started to get bad. The prime source of the foreboding in this work is indeed climate change and the fear of a devastated planet. The imaginary object in the image bears some resemblance to an organic form, possibly a part of an animal’s anatomy – perhaps a horn or a jawbone. The slender forms that protrude from what may be the teeth of a jawbone could possibly be legs, turning the form into something like an upturned crustacean. Whatever it is, the object has the feel of a decaying life-form. 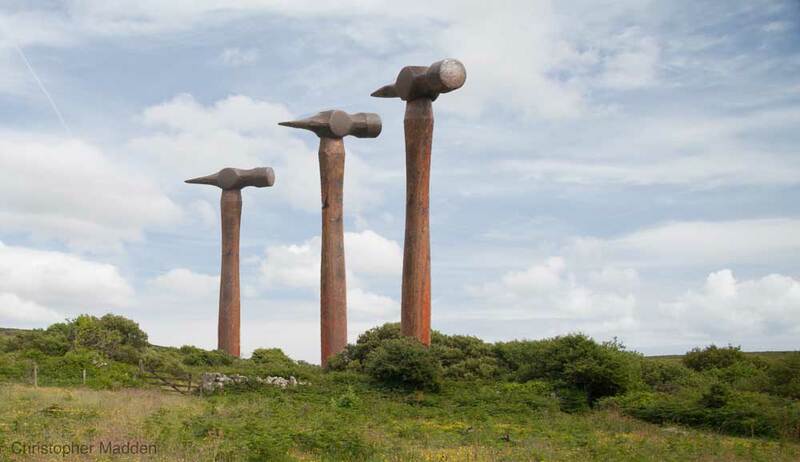 The object also has something of the feel of an unnatural artefact – perhaps a piece of rubble following the destruction of a building (with the slender forms representing metal rods in reinforced concrete). Whatever it is, the object is abandoned or marooned on a featureless plain that probably represents the devastated earth following the ravages of climate change. The fact that the object looks very large is probably symbolic of the enormity of the threat that climate change represents. Having said all that, the work was not created with any particular symbolism or meaning consciously in mind. I’ve worked backwards from the finished image to find its possible meaning. I’m sure that it also has meanings that are purely to do with the workings of my own brain. 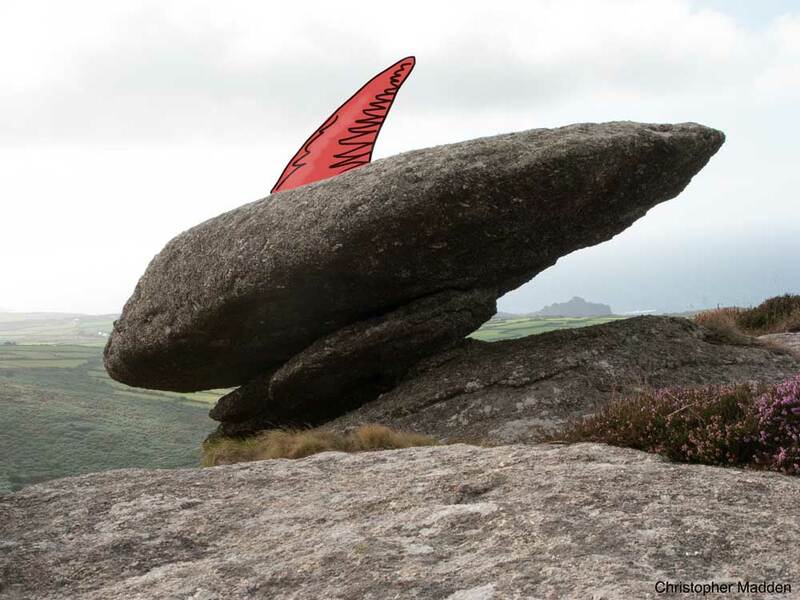 A photograph of a natural granite rock formation with a drawing of a fin-like object added to the photograph as though it is attached to the rock. 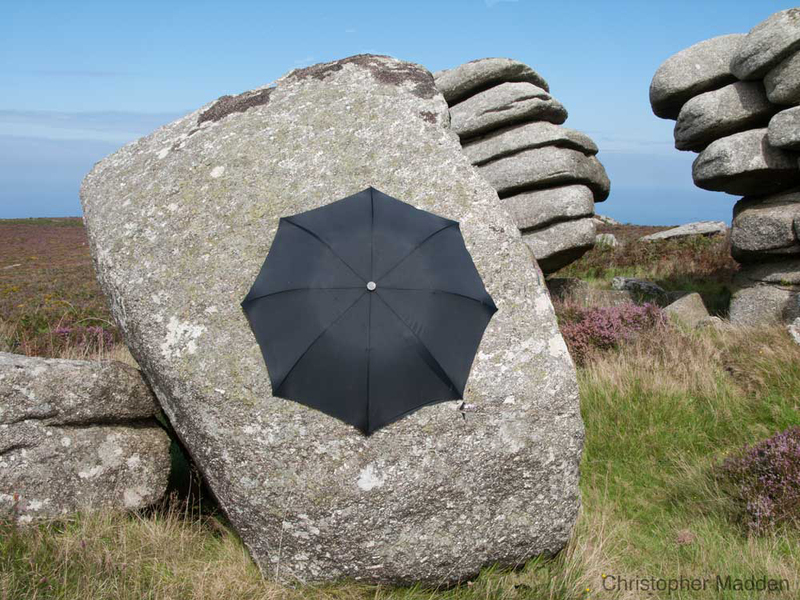 The rock formation in the photograph is on the Penwith peninsula in west Cornwall, a few miles from St Ives. The large rock on which the fin is drawn is a rocking stone, known locally as a Logan stone. The stone is said to move slightly when pushed correctly. The image is a finished artwork, despite the fact that it resembles a concept study for a sculpture in the landscape. 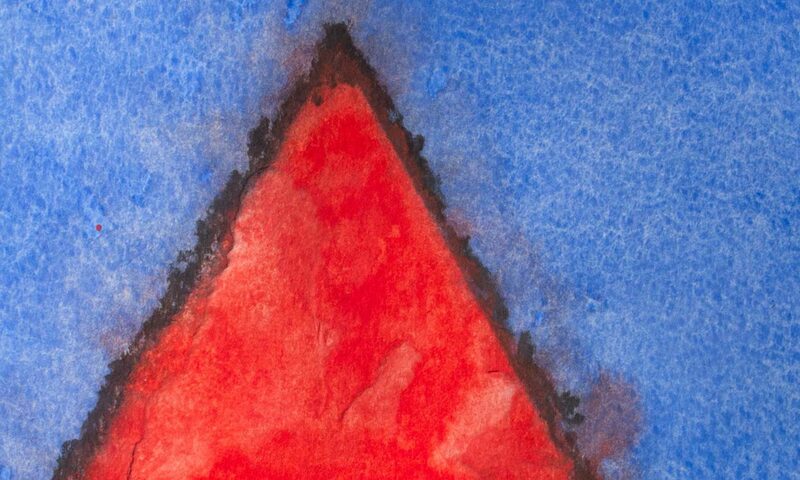 The drawing of the fin is deliberately inconsistent in terms of photographic realism with the rest of the image. Having said that, the development of the concept as a sculpture is a possibility. A photomontage of a concept for a sculpture in the landscape. 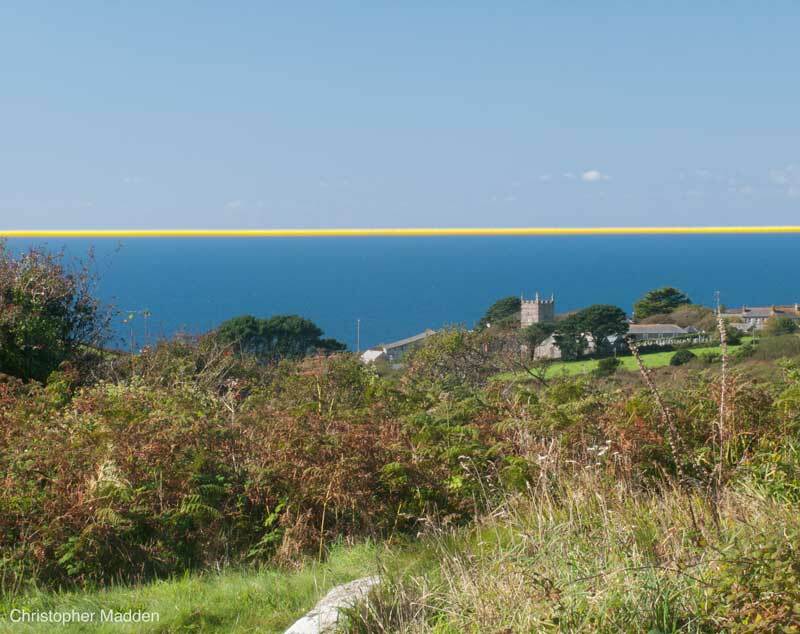 The landscape in the photograph is the Penwith peninsula in west Cornwall. The hammers are meant to project a sense of overbearing force, the fact that there are several of them possibly implying organised force (such as military force). Hammers, to me, have a certain anthropomorphic quality to them, suggesting a degree of human identity – a long thin body with a head at the top. The blank facelessness of the heads of the hammers in this image suggest a mindless power. 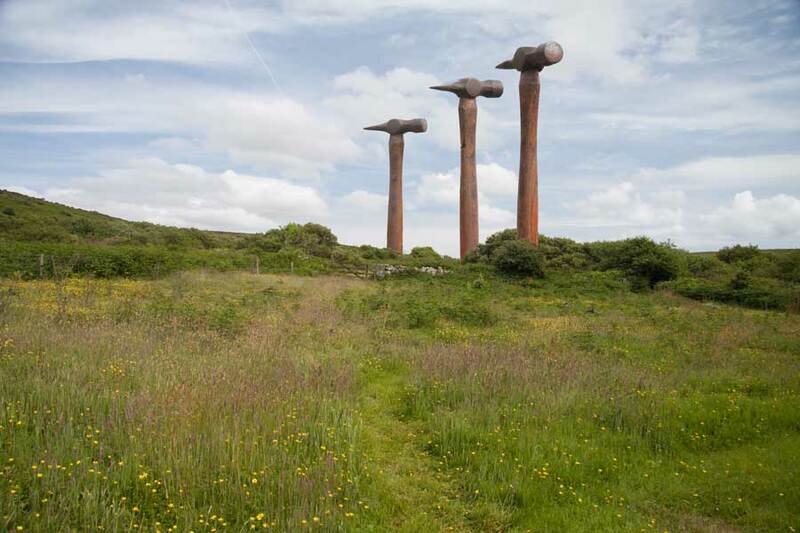 The concept also contains an element of humour directed at the art world, in that the massive scale of the work comments on the often gigantic scale of works of sculpture and other interventions in the landscape. Oversized everyday objects are a common feature in sculpture. 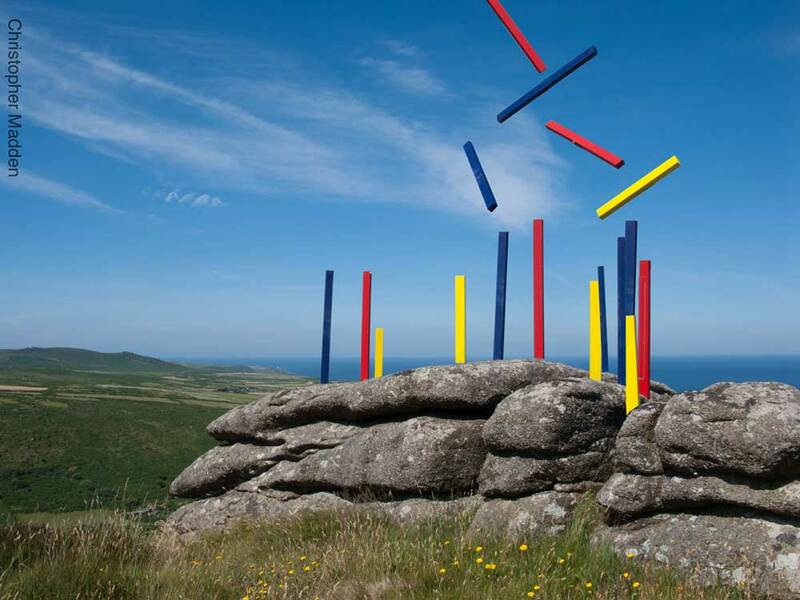 One of my (temporary) sculptural works in the landscape in Cornwall near St Ives. A transient sculpture composed of lengths of painted wood battens (the type of wood commonly used in building construction). The sculpture was created by positioning a small number of battens in the landscape, photographing them, repositioning them and rephotographing them. Then merging the photographs. As a result the work has an interesting relationship with time. The sculpture never existed in its entirety as depicted in the photograph, each batten only being in position for long enough to take a photograph. The sculpture only takes on its final form when the twenty-five minutes that it took to position and photograph the battens are compressed into a single instant. 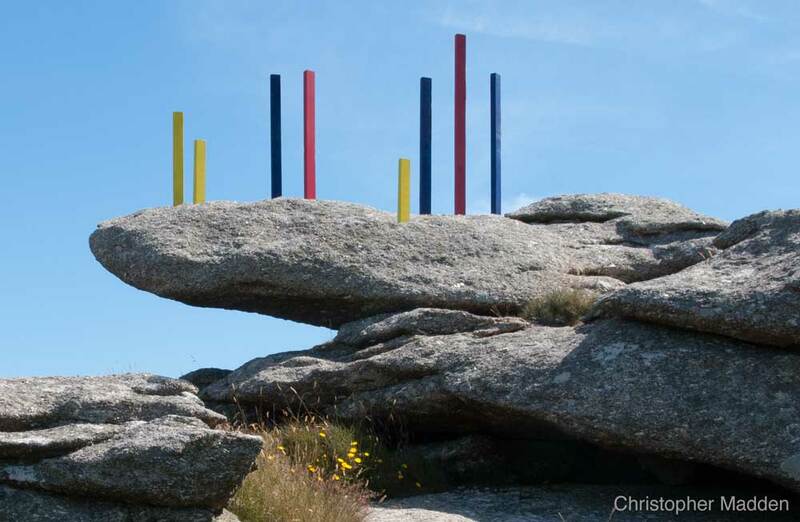 A work of land art, an intervention in the landscape, or art in the environment. The wood battens are about a metre long. A video of a field of buttercups that contains a hard-to-see object. The object is revealed at the end of the video. The video is on a recurring theme in my work – an investigation into perception, reality and illusion. The video was taken near St Ives, Cornwall. Spoiler alert – the nature of the object in the video is revealed in the next section. The scene in the video contains, on the ground amongst the grass and buttercups, a square mirror. The mirror is hard to see partly because of the distracting proliferation of buttercups, but mostly because the mirror is positioned so that the light from the sky doesn’t create give-away shadows or highlights (buttercups that are reflected in the mirror can look abnormally lit compared with the rest of the buttercups if the angle of the light is incorrect). The work is filmed in an almost cliched, very peaceful and calming field full of spring flowers, which to me makes a nice setting for a work that at its most pretentious can be interpreted as being a prompt for questioning the nature of reality. At its least pretentious however, it’s just a nice visual joke. Mirrors and reflections are common features of my work, as can be seen in the Mirror Art section of this site. 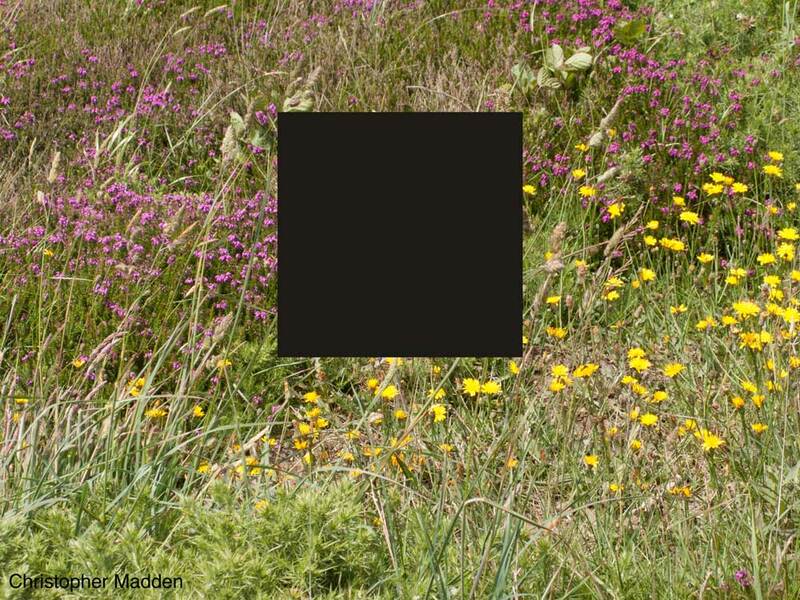 A gray square floating in a clearing among bushes in the countryside (near St Ives, Cornwall). The video is of an early study to assess the potential for the concept. Finished works based on the concept would consist of squares suspended in the environment in positions where members of the public would encounter them, such as along pathways in sculpture parks. The locations of the squares could vary from trackside positions that are below eye level, at eye level and above eye level, where the squares would be seen to move relative to the landscape as the observer walked past. Squares could also be positioned high in the air, sometimes directly above the track, so that they are constantly silhouetted against the sky. The square in the video, which seems to be floating in the air unaided, is of deliberately uncertain substance or nature. What is certain is that due to its shape, its colour and its position suspended in the air, the square is not a natural part of the environment. One concept for the work is for the squares to be coloured with a non-reflective black (see image below) so that the floating squares could almost be mistaken for black portals out of the universe and into a featureless void. 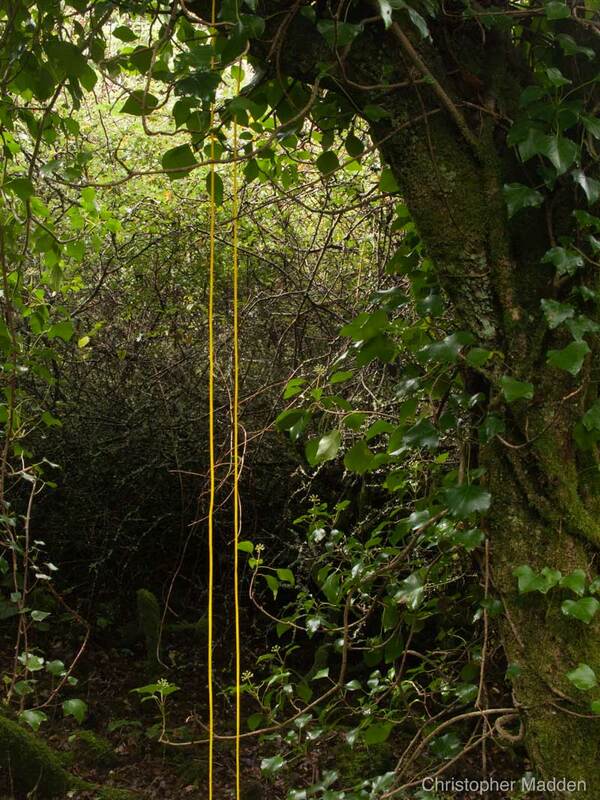 This work consists of a length of brightly coloured cord hanging over the branch of a hawthorn tree in a patch of woodland near St Ives, Cornwall. The simplicity of construction of the piece is important. The observer will hopefully notice the almost total lack of endeavour required to create the work, while also noticing the (hopefully) relatively high aesthetic payoff as a result of that endeavour. The two bright vertical lines formed by the work contrast sharply with the dark shadows and the tangled and twisted branches and twigs of the hawthorn and blackthorn in the wood. The fact that the cord creates two hanging lines gives the cords an increased presence when compared with a single hanging cord. They seem to resonate against each other and create a more concrete effect than would be achieved with a single one dimensional strand. A lot of land art and other art in the environment strive to use only natural ingredients in the composition of the art, good examples being the work of Richard Long and Andy Goldsworthy. This work however consciously uses artificial material in the form of nylon paracord. The placing of brightly coloured plastic into the environment refers partly to humanity’s imposition of artificiality onto the natural world. This is partly a message about the despoiling of the environment by our endeavours. The fact that the nylon cord is simply draped across the branch of a tree helps to reinforce this message, as the cord acquires qualities associated with the detritus of our throw-away consumer society. The fact that the cord is plastic reinforces this further, and the fact that the straight lines of the cord are cutting through the organic forms of the woodland gives a slight sense of violent imposition. However, the brightly coloured plastic looks quite pleasing in some ways and to some sensibilities, so the work is also saying that humanity’s imposition of artificiality onto the environment has a positive side to it (but also that just because something looks nice doesn’t necessarily mean that it is). In fact, where would we be without the artificiality that we impose on the environment? The artificiality that we create is one of the greatest achievements of the human race. Would you like to live without the electric and electronic devices that populate your life? (The coloured cord could easily be a length of electric cable). The main problem is that we just create too much artificiality. Hence some of the ambiguity in this piece. The use of coloured cord in this work was undoubtedly inspired by the work of Fred Sandback. 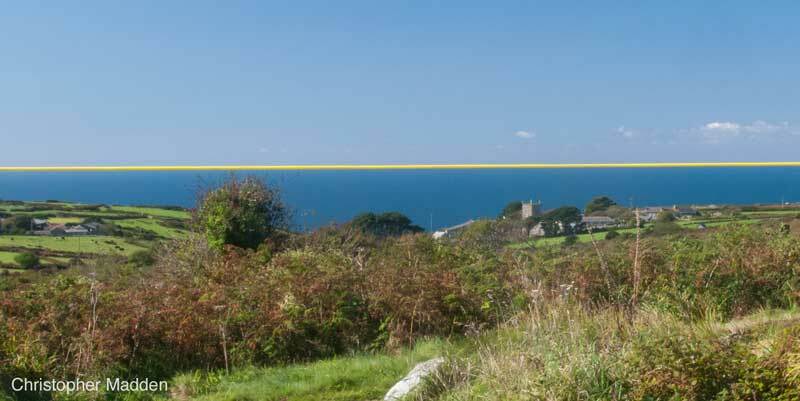 A photograph of a length of brightly coloured plastic cord stretched horizontally so that it coincides exactly with the horizon. This is an unmanipulated photograph. 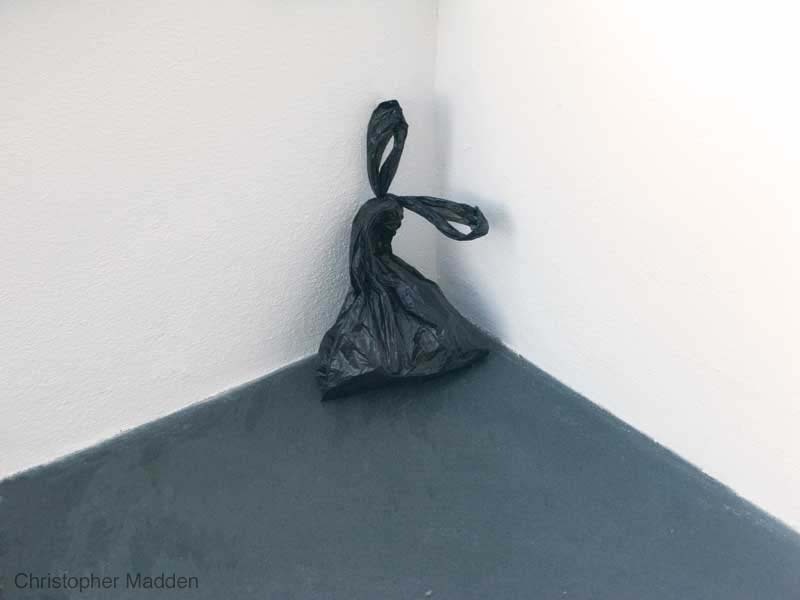 The work is partly about the all pervasive presence of plastic in our lives and the environment, with the piece of plastic cord seemingly stretching all the way along the horizon. The fact that the line of the cord is along the horizon created by the sea links the cord with the plastic pollution that is present in vast quantities in the oceans. As well being a metaphor for the plastic that is polluting the oceans, the cord also signifies that plastic is in many ways a very useful and pleasing substance (without which our modern world wouldn’t be able to function). This is indicated by the fact that the cord creates a very pleasing aesthetic effect. The major problem with plastics is the complex molecular structures that are created during the creation of the plastic – when plastics are developed that don’t have those structures, and that thus decompose properly, the plastic problem will be greatly reduced (although of course it will still be a problem, along with all of the other problems that we are inflicting on the planet). The work also exists at a purely aesthetic level, with an appeal generated solely through the juxtaposition of the horizon and the cord. A detail of the photograph to show the church. This is a piece of art that I created recently that’s inspired by frequent unpleasant encounters with dog poo bags while out on walks in the countryside. On one walk along a popular track up a mountain in Wales last year the poop bags were so frequent that they inspired me to conceive of the idea of a path lined with an avenue of poop bags. I’m looking out for a suitable venue. For the work in these photos it was a small step to move a single bag from the countryside to the art gallery. The question is, is it a real dog poo bag or not? All that I can say is that it’s described as being ‘mixed media’. A work concerning climate change and pollution. This work is created in a cartoon-like style. There are several reasons for this. One is that I create quite a lot of cartoons (which have been published in newspapers such as the Guardian and magazines such as Private Eye), and another is that I think that the cartoon style is a particularly good way of communicating about subjects such as global warming, pollution and the various crises that are currently afflicting our planet. 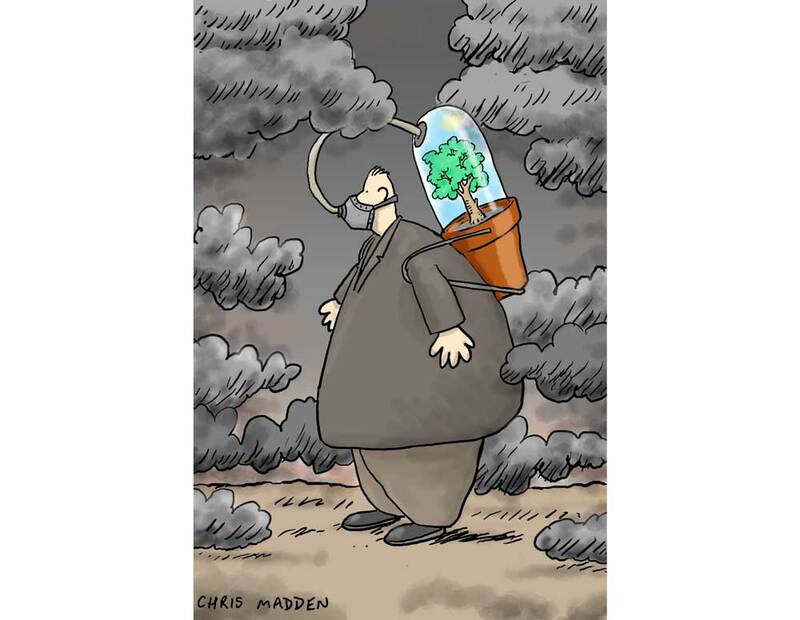 One of the appeals of the cartoon art style is that it generally lacks ambiguity, so its message is clear and unmistakable, which is very important with subjects that are as important and clear-cut as climate change. 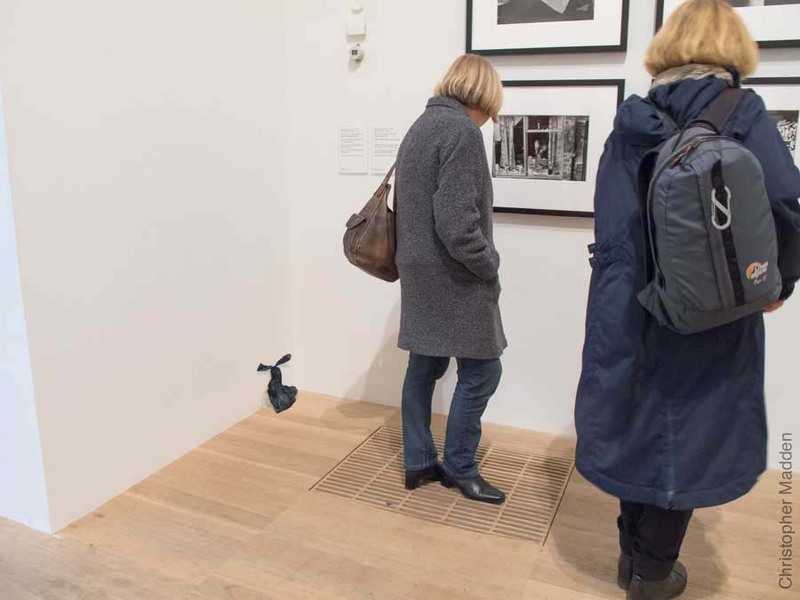 Other contemporary art styles on the other hand tend to thrive when they contain a degree of uncertainty in what is being said, requiring the viewer to interpret the work as they see fit. Contemporary art that puts forward a message unambiguously can often tend to come across as rather dead, didactic and hectoring. 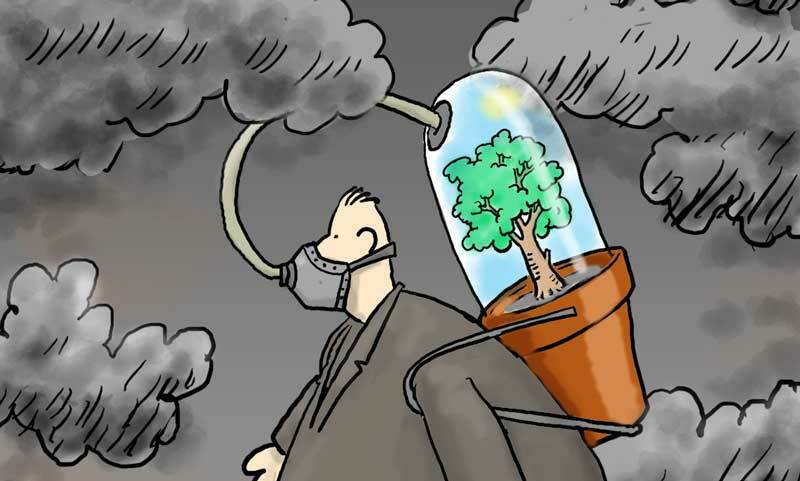 Also of course, cartoon art, due to its nature, can easily be reproduced in print or electronically without loss of quality (both physical quality and emotional quality), thus making it available to a much wider audience than most contemporary art – which can only be a good thing when the work tackles an important subject as climate change.